Daily Hours are 9:00 a.m. to 5:00 p.m.
We are available most days by appointment after Labor Day, weather dependent. Please call to schedule a ride time during the off-season. Between Nehalem and Manzanita on Hwy 101. Continue onto 34600 Garey St. and follow signs to Nehalem Bay State Park. Our stables are located past the Nehalem Bay State Airport and Boat Ramp in the Day Use Area. Enjoy a scenic ride on beach trails, through sand dunes, to the ocean beach. Stop for pictures on the beach. Guided ride, Walk on the beach, returning on dune trails around beautiful Nehalem Bay. What a great ride! One hour riding down on the beach to the end of the spit. Stop for pictures on the beach. Ride over to the bay through sand dunes to see seals basking in the sun or swimming in Nehalem Bay. Ride along the bay through ocean trails and dunes. Numerous wildlife from eagles, deer and elk. Guided ride, walk only on the beach. Special requests can sometimes be accommodated. Deposit reserves a saddle for ride time. Deposit will be subtracted from total amount. Please call to schedule or confirm a ride time and date. Balance to be paid in cash only, no checks before riding. credit card to pay balance. Please remember $5 parking fee at Stop Sign Kiosk. 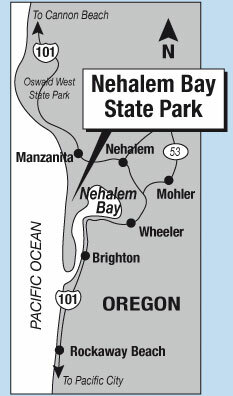 The concession in Nehalem Bay State Park is being run under contract with Oregon Parks and Recreation Department. All Content Copyright 2018 Oregon Beach Rides LLC.